Software pre-loads are a somewhat controversial practice among resellers in the industry. If done right it can be a great value-added incentive and a tremendous marketing tool. If done poorly, as some major vendors such as Dell, HP and Sony do, it can annoy and possibly alienate customers from both the product and the reseller. The key to success: common sense, good judgement and moderation. Customers typically want their computers to have what they need on their PC at the time of purchase without having to shell out a lot of money. Trial versions of popular applications can give the customers some functionality without the added cost of purchasing full versions right off the bat. Trial versions can also introduce new products to customers. A “try before you buy” approach can often hook a customer into the application and entice them to purchase the full product, hopefully from the reseller who sold them the PC. This upsell opportunity can help solidify the customer-reseller relationship and give the reseller an added advantage as a one-stop resource for additional products, service and support. However, while they can be a great value-add to a new PC and can entice sales of full product, some large OEMs will overdo it and load down the machines with so much trial software programmed to boot up with the system that it often bogs the machine down, taking up system memory and space on the hard drive, negatively affecting performance and clogging up a new PC. For this reason, many customers also have this software immediately removed, often paying their tech to do so. 1. Know your customer. Listen to him or her. Find out what he or she needs and offer only the trial products that are most likely to meet them. If the customer is using the PC for accounting, a free trial of anti-virus software is fine as protection is necessary, but why load it down with trial games? Everyone likes to get something for free but if it isn’t used or needed, free stuff is useless. It’s just common sense. 2. Whenever possible, install the trial products with prudence. Some software such as anti-virus programs will need to start and run with the operating system, but that free trial version of MS Office doesn’t need to load up and run the entire suite on boot. When installing trial products, configure them properly. Let what needs to run immediately load up and turn everything else off. Let the customer decide if they want to run the applications and when. Optimize the system for best performance. Let the PC run the software. Don’t let the software run the PC. Install trial software with the customer and performance in mind. Use good judgement. 3. Don’t try to be everything to everyone and don’t try to sell everything at once. Everyone needs anti-virus and anti-malware scanners, but do they need them all? I purchased a Dell laptop once that had software for half a dozen ISPs. It was a huge turn-off and it was the last Dell I bought. I’ve seen brand new PCs with multiple Office suites, utility suites, multimedia applications and security products. Why does anyone need free trial versions of four different backup solutions? They don’t. It may also confuse them as to which one you recommend and endorse as a reseller. Offer a limited number of different products and only one of each type. Pick a vendor you recommend, trust and support for each and install a trial version of the product. Don’t try to install and sell every single application on the market. Promote and sell, but do it sensibly. Use moderation. (TheForceField.Net ) October 27, 2009 – NASBA is now offering a free 60-day trial version of security software from Kaspersky Lab for resellers. The software is intended for system builders, VARs and integrators to pre-install on the systems they build and sell to their customers as a value-add for their products. NASBA, one of the largest IT and CE reseller trade associations in North America, announced the offer in an e-mail to members October 22. Free trial versions of security software suites is nothing new, of course. McAfee and Symantec have been offering trial versions of their anti-virus applications for years through large OEMs such as Dell and HP. What makes the Kaspersky offer different is that it is a 60-day free trial, which is double the usual 30-day trial period most other vendors offer. This is smart move on the part of Kaspersky as it is a more soft sell approach as it eases pressure on the customer to make an immediate purchase decision, giving the initial PC purchase and the product itself more value. In addition to the free trial, special discounts are being offered on KIS products to NASBA members through D&H distributing. Resellers who have accounts with D&H can contact their D&H rep for details. Membership to NASBA is free for VARs, system builders and other IT resellers. For more information contact NASBA at http://www.nasba.com . BOSTON – October 21, 2009 – OnForce , the trusted online services marketplace that matches solution providers with quality, local service technicians across the U.S. and Canada, today released the OnForce Services Marketplace Index (OSMI) for the third quarter of 2009. Based on tens of thousands of service events this quarter across North America, the OSMI provides a comprehensive analysis of spending trends in information technology (IT) and consumer electronic (CE) services. Key findings show that average work order pricing across the OnForce marketplace remained stable for the second consecutive quarter. Additionally, OnForce saw spending in break-fix work decrease slightly and a small increase in new equipment installations. experiencing a period of downward pressure. Install work grew this quarter by 4 percent, offsetting the number of break-fix service events, which declined from 63 percent in the second quarter to 61 percent in the third quarter. VoIP, network, and audio saw the highest installation rates. · The “Other” category accounted for nearly seven percent of all work order volume in Q3, remaining at an elevated state as enterprises continue to use OnForce for non-traditional and emergency service work. · Hourly rates for home theater onsite service were the most expensive within the Consumer Electronics category. · Maine, New Hampshire, and Nevada were the least expensive states for onsite services in Q3, a shift from Q2 when Kentucky, West Virginia, and Maryland were the least expensive. · Houston, Chicago, and New York saw the most onsite service volume in Q3 for the fourth quarter in a row. The OSMI Q3 2009 report is available for download at http://www.onforce.com/OSMI/Q309 . OnForce is service made simple. The company provides access to a trusted national network of more than 13,000 onsite service technicians connecting service demand with local supply through an online marketplace — easily, efficiently, and profitably. With more than one million completed service orders, OnForce is a proven leader in helping solution providers increase profits, gain a competitive advantage, and contain service costs. The OnForce community is made up of 5,000+ IT and CE solution providers and more than 13,000 service technicians who work in a number of technology categories, including computers, printers, networking, VoIP, point of sale, and consumer electronics. For more information, visit www.onforce.com . IObit is giving away full one-year licenses of Security 360 Pro anti-malware utility until November 11, 2009. IObit Security 360 is a antivirus and antimalware program that detects and removes spyware, keyloggers, trojans, worms and other malware, The utility is available in both Free and Pro versions and they are basically the same program, although the Pro version has more features. the free version is available to download for non-commercial use. The Pro version includes full functionality and sells for $29.95, however, IObit.com is currently giving away a free one year free license for the Pro version until November 11. To obtain a free license, go to http://db.iobit.com/license-free/win7-special-offer.php , download the trial and submit your e-mail address. Online Conversations Tracking Across Forums, Review and Social Media Websites: Application Compatibility, Migration and New Features Top the List of Topic Areas Discussed Around the Upcoming Windows 7 Launch. New York, NY (Vocus/PRWEB ) October 21, 2009 — iYogi, the fastest growing on-demand tech services company, announced today the results of tracking tens of thousands of online conversations around the subject of http://windowsWindows 7 [Microsoft. In a look at online discussions over the last week in ten widely used forums, 25 review sites, and four of the largest social networks, iYogi found that application compatibility and migration by far topped the list, followed by discussions around features and performance. Polls conducted by iYogi have indicated that nearly 70 percent of users are not entirely comfortable that they will be able to easily move their favorite applications over to the new Windows 7 platform, and nearly half expect to need more tech support help in order to do so. 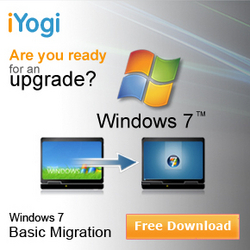 In order to address these questions and concerns, iYogi has built a comprehensive website at http://windows7.iyogi.net with details on Windows 7 features, migration utilities and support options, along with a step-by-step guide to application migration. iYogi has more than 90,000 annual subscribers and provides thousands of support sessions every day on a 24/7 basis. Its Global Delivery Platform delivers on the highest customer satisfaction benchmarks in the industry. iYogi is a global on-demand services company that provides personalized computer support for consumers and small businesses in United States, United Kingdom, Canada and Australia. iYogi’s unique model, including proprietary technology iMantra and highly qualified technicians, is designed to eliminate computer-related stress and keep millions of digitally dependent consumers and small businesses always protected and productive. Only iYogi — with its proven global expertise delivery model, intelligent customer insight systems, easy-to-use self-help tools and automated PC optimization and computer support services – offers users a simple yet comprehensive path to digital serenity. iYogi has perfected the remote technical support model to overcome the current limitations of in-store, on-site, or call center services to become the fastest growing provider of support in the industry. Major resellers and technology companies are increasingly turning to iYogi to improve customer satisfaction, reduce return rates, and deliver a compelling new-value added offering to customers. For more information on iYogi and a detailed list of technologies supported, visit: http://www.iyogi.net. Michael Newman Consulting specializes in internet and social media marketing. Newman's recently launched blog attempts to provide insightful information for companies needing to expand their internet marketing strategies – or in this case how NOT to expand their strategies. San Marcos, CA (PRWEB) October 18, 2009 — Michael Newman, a product management veteran of the electronics and audio industries has a top ten list for those companies wanting to accelerate their slide toward bankruptcy. "Social media marketing is about creating and fueling engaging content," says Newman. "What better way to get people's attention than to take something serious like our messed up economy and turn it around." Newman brings a fun spin to the topic by mentioning how to gain more time watching CSI Miami by killing your business. However the bulk of the blog post has very sound advice – as long as you do the opposite of what is recommended. Topics include tying internet goals to company business objectives, communication with customers, knowing exactly who your customers are and using very defined strategies with social media marketing. Other blog topics include using forums for unfiltered consumer feedback. To check out Newman's blog and post a comment, please visit: http://michaelnewmanconsulting.com/blog/. For more company information visit the web site. Contact information is below. Users of Microsoft’s Sidekick smartphone experienced an outage early this month that nine days later turned out to be catastrophic. While its not the first time a communications platform has experienced downtime, this time it’s different. This time users didn’t just lose service, they lost access to all their data. Many lost all of the data itself. Permanently. The outage is the talk of tech sites, blogs and forums and raises what many believe are serious questions about the future cloud computing. The Sidekick is a smartphone developed by Microsoft-owned subsidiary Danger, Inc. and sold by T-Mobile. User data such as calender entries, photos, address books and to-do lists are all stored on Microsoft Danger servers utilizing a Storage Area Network. On October 1, 2009 Danger’s servers went down, taking user’s data off line. According to some reports Microsoft was performing an upgrade on its SAN when something went terribly wrong. At first it was believed to be only a temporary outage and by October 8 access to most of the services was restored. However much of the data was not and two days later Microsoft sent an e-mail to users and a notice was posted on T-Mobile’s community forums admitting their data was likely gone for good. The reason? Microsoft did not back up the servers prior to the upgrade. Rumour has it the snafu is being blamed on Hitachi , who Microsoft allegedly hired to perform the upgrade. Whether this is true or not is irrelevant to users now. The fact is, Microsoft lost their customers’ personal data and there was no backup. The damage was done. The irony of all this is that, overall, the entity responsible for this epic fail is Microsoft, a company that should know better. Backup, backup, backup. Isn’t this something Redmond has drummed into our heads over the years? Of all companies to trust with our data shouldn’t they be the company most responsible to manage it? Now, granted, Microsoft’s business model was not built on cloud computing. Their core business model is based on desktop computing, selling operating systems and software that reside directly on the desktop. In fact, Microsoft CEO Steve Ballmer has stated in the past that he doesn’t think the public is ready for working in the cloud and to a certain extent he has a point. In spite of Ballmer’s rhetoric Microsoft enter the arena anyway but it seems as if it did so only half-heartedly, a move that was likely made more for the sake of keeping up with Google than actually doing anything innovative in the cloud itself. This brings up the most important question. Is cloud computing ready for prime time and is it really safe to trust it with your data? This isn’t a new discussion at all, but after such a massive and destructive event as the Sidekick outage it does remind us how important and controversial a question it is. For instance, many tech business owners, myself included, have been hesitant to promote or sell cloud-based solutions to our customers simply based on the uncertainty as to whether or not the cloud can be trusted. Take back-up solutions, for instance. There are a number of companies who offer them today and there are a myriad of opportunities to partner with these companies for recurring sales revenue. However, no matter how secure the data is, anything in the cloud is potentially hackable, an inconvenient truth that, unfortunately, has already been proven time and time again. Aside from the security aspect of placing a data backup in an environment that is just “out there”, one that is essentially virtual and could potentially be accessed by anyone, anywhere at anytime, there is the aspect of reliability as well. Anyone can claim 99.9 percent uptime, but that percentage is relative depending on the length of time against which that percentage is measured. . 1 percent of a day is not very long at all. .1 percent of a year or two is something else entirely. What if a small business customer backed up all their data to a backup service and that service had a Sidekick event? What if that data backup was unrecoverable? The potential effects could be catastrophic, not only for the customer who lost their data but for the service provider who recommended and sold that service to their customer. Is the loss of that customer and the potential damage to the service provider’s reputation worth risking for an extra buck or two each month? Yes, it sounds overly paranoid of course, but these are questions some service providers ask and among the reasons why some may not recommend or offer such services to their customers. While It may seem like an overreaction, it could happen and it already did happen to Sidekick users, only worse, because it wasn’t a mere data backup that was gone, it was the data itself that was destroyed. Considering the fact that Microsoft purchased a company called Danger and never changed the name was probably not the best move in terms of marketing or building trust in a brand. Since the outage, the name itself now carries a whole new meaning. Seriously, a huge behemoth called Microsoft owns a company called Danger which put all its user’s data in real danger by not backing up its own servers and subsequently lost it all, providing a reason for those who are not fans of cloud computing to bolster their argument that trusting your data to the cloud can be Danger-ous. Now, that’s ironic. Incidentally, Danger initially launched the Sidekick on October 1, 2002, exactly seven years to the day of the outage. Port Washington, New York (Vocus/PRWEB ) October 6, 2009 — According to leading market research company The NPD Group's 2009 Household Penetration Study, approximately 12 percent of all U.S. computer owning households own an Apple computer, up from 9 percent in 2008. While Apple ownership is growing, those households are decidedly in favor of mixed system environments. Of those 12 percent, nearly 85 percent also own a Windows-based PC. Multiple computer ownership is a common thread in Apple computer households, with 66 percent of households owning three or more computers, compared to just 29 percent of Windows PC households. Apple owning households are decidedly more mobile as well, with 72 percent of them owning a notebook, whereas only 50 percent of households that have a Windows PC own a notebook. Not only do Apple computer owners own more computers (and more mobile computers) than the norm they also tend to own more types of electronics, and more of them, than typical computer owning households. For example, while 36 percent of total computer owning households have an iPod, 63 percent of Apple households have one. And while almost 50 percent of Apple owners own some type of navigation system, only about 30 percent of all computer households own one. "While Apple owners tend to own more computers and more electronics devices, there is also a high correlation among Apple owners and more affluent consumer households," said Stephen Baker, vice president of industry analysis. "Thirty-six percent of Apple computer owners reported household incomes greater than $100,000, compared to 21 percent of all consumers. "With a higher household income, though, it's not a surprise that those consumers are making more electronics purchases," Baker said. 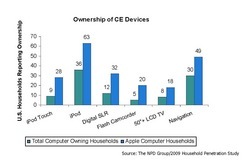 "The average Apple household owns 48 CE devices whereas the average computer household owns about 24. Apple household owners' actions and purchases can be used by the industry as leading indicators for hot new products and adoption." A total of more than 2,300 of NPD's online panelists completed this survey. The NPD Group is the leading provider of reliable and comprehensive consumer and retail information for a wide range of industries. Today, more than 1,700 manufacturers, retailers, and service companies rely on NPD to help them drive critical business decisions at the global, national, and local market levels. NPD helps our clients to identify new business opportunities and guide product development, marketing, sales, merchandising, and other functions. Information is available for the following industry sectors: automotive, beauty, commercial technology, consumer technology, entertainment, fashion, food and beverage, foodservice, home, office supplies, software, sports, toys, and wireless. For more information, contact us or visit http://www.npd.com/ and http://www.npdgroupblog.com. Follow us on Twitter: @npdtech and @npdgroup.